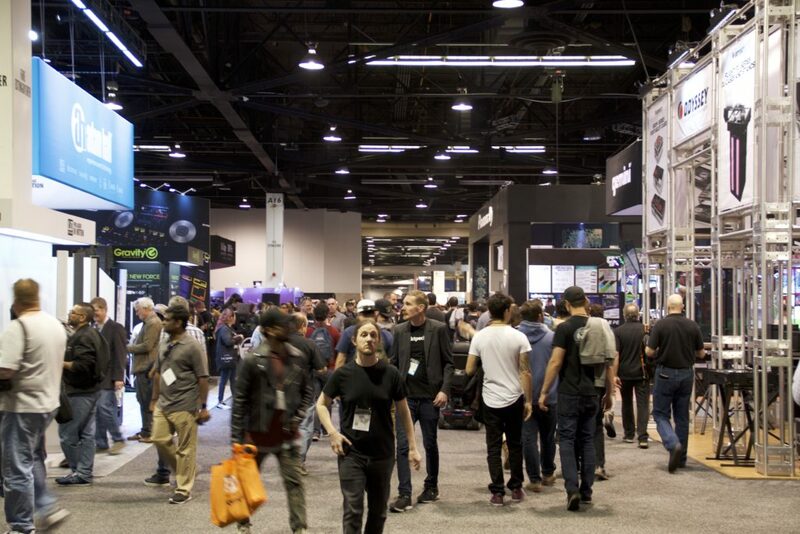 With almost 20,000 booths, interactive workshops, lectures and more, this year’s National Association of Music Merchants (NAMM) show at the Anaheim Convention Center in Anaheim, Calif., was one of the biggest yet. What’s this convention all about? This exciting, four-day event showcases some of the latest innovations and state-of-the-art developments in music, stage and production technology. Musicians, producers, technicians, engineers, teachers and artists from all over the world convene once a year to network, get the latest industry scoop and, of course, spend hours geeking out over some high-quality gear. Here are some standouts from this year’s convention! While technology and instruments are undoubtedly the centerpiece of NAMM’s draw, the musicians actually demonstrating them often fly under the radar. 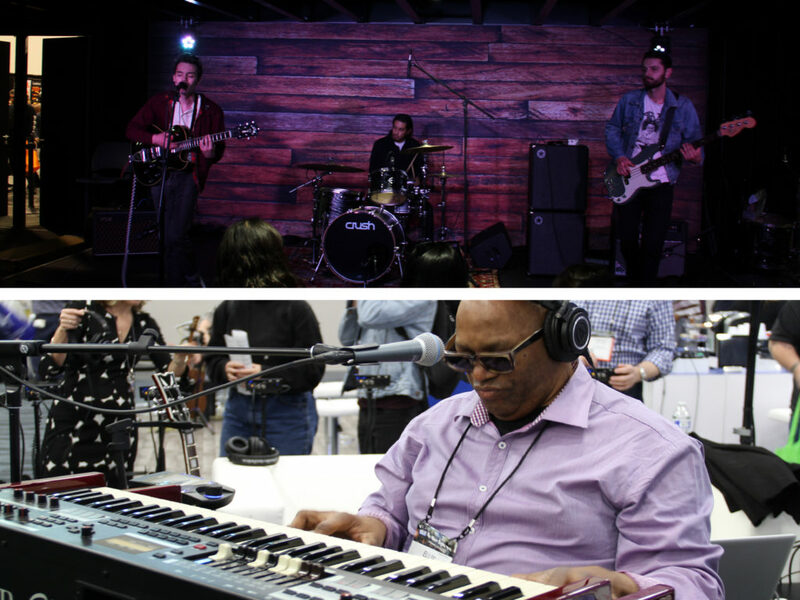 Several prolific musicians were scattered throughout NAMM, serving as ambassadors for respected industry brands. Arriving at the convention center Saturday morning, I saw Ellis Hall setting up to perform at the Synthax Inc. exhibit. The former lead singer of Tower of Power, also known as the “Ambassador of Soul,” sang a vibrant and soulful set of blues, soul and R&B, making for an ideal start to the day. His performance could be heard through the MyMix II personal mixing system–a compact mixing board, allowing listeners to change instrument/microphone volumes, add effects and essentially “create” your own mix on the fly, in real time. 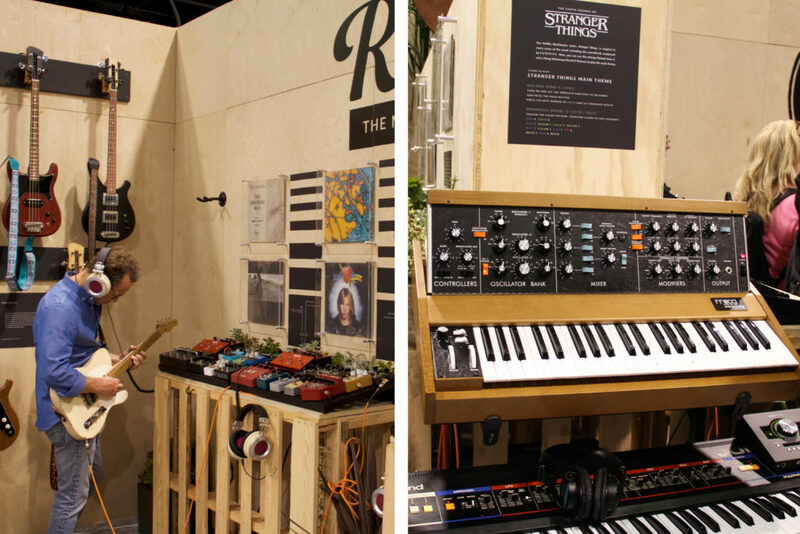 Another performance highlight was rising Californian outfit SadGirl, who took the stage at the Korg exhibit. Their mix of reverb-laden ’60s surf rock and soulful doo-wop was a winning combination for the day. Touted as the “Musician’s Marketplace,” Reverb.com is a one-stop-shop for buying instruments, accessories and assorted music technology, while also boasting a wealth of online music content—including guitar lessons, musician interviews, how-to videos and product demonstrations. Their most fascinating attraction this year were interactive instrument stations that taught novice users how to play some instantly recognizable tunes. One such station taught me how to play the ’80s synth-worshipping theme song of the hit Netflix show, Stranger Things. By giving a step-by-step guide on settings to adjust and keys to hit, I was playing the song within minutes. A similar station guided me through playing “Everything In It’s Right Place” by Radiohead, while a few guitar-centric stations taught players how to emulate the classic tones of icons like Albert Hammond, Jr. (The Strokes), Tom Petty and others. The exhibitors at NAMM know that creating better technology for the future is inseparable from respecting the past. With the current resurgence of interest in vinyl and analog technology, many brands placed interesting and eye-catching musical artifacts on display this year. A museum-like exhibit in the main lobby showed rare, behind-the-scenes photographs of ‘60s and ‘70s rock and folk musicians, such as candid shots of Jim Morrison and The Doors at the notorious Morrison Hotel, or Neil Young hanging out at his ranch in Southern California. 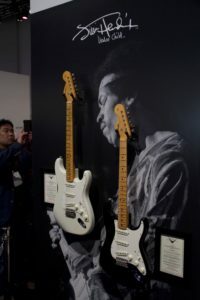 Fender, one of the most respected names in guitar brands, displayed a cream-white Signature Series Stratocaster, designed almost exactly like the one Jimi Hendrix loved to play. 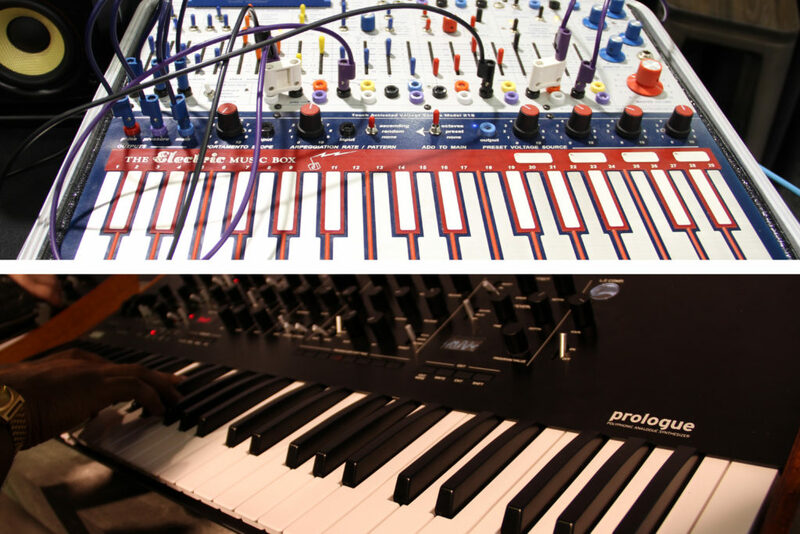 In a nutshell, analog synthesizers generate sound through electrical circuits and components. With an almost infinite capability of expanding that sound through modulation knobs, filters, oscillators and more, synthesizers are powerful tools for doing anything from playing a lead melody, to creating a complex tapestry of sounds. First introduced to the mainstream market in the ’60s, they became popularized in pop music through electronic, new wave and dance genres. Two highlights from the countless analog synthesizer booths were the Buchla Music Easel, a ’70s style portable “electric music box” and the Prologue, the newest professional synthesizer by Korg. Both these products have a stunning sense of efficiency, allowing even amateur players to intuitively understand how different effects work, and build their own beautiful sounds from scratch. This landmark event was the most unique spatial activation throughout NAMM and closed the entire convention out on a high note. With over 80 pianos, “Roomful of Pianos” invited teams of musicians to play in unison, filling the hall with incredible, uplifting sounds. 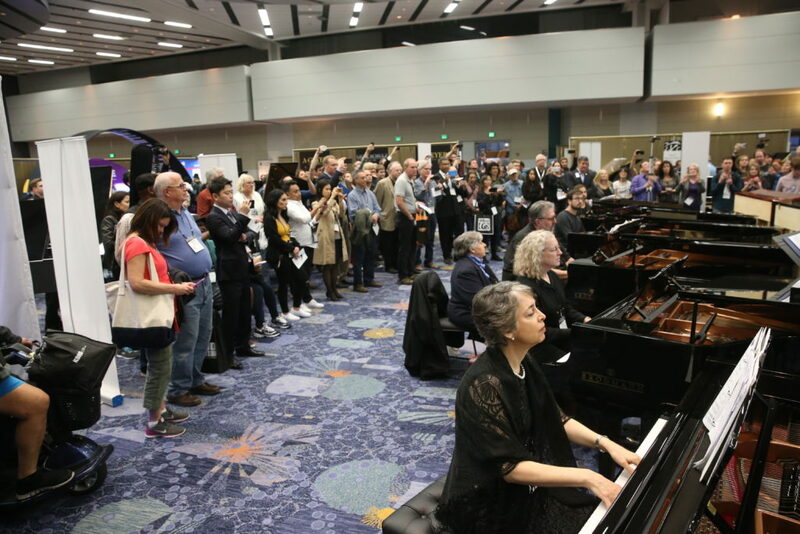 While some groups performed classical or symphonic compositions, others adopted a jazzy bop, letting a few pianists solo over a rhythm section more than a dozen pianos strong. After a day full of technology, hearing a room full of pianists was a much-needed therapeutic conclusion. After this jam-packed day of musical wonders, it’s safe to say that we’ll be back next year for more! This entry was posted in Beyond Levitt and tagged Music technology, NAMM on January 31, 2018 by Rounak Maiti.